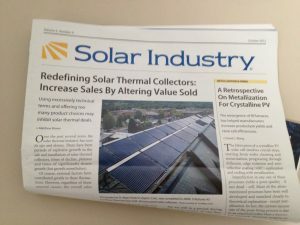 FOR IMMEDIATE RELEASE- Friday,November 2, 2012 – Binghamton, New York – Solar Industry is a magazine that is distributed monthly to participating producers and interested consumers within the solar industry. The magazine focuses on tools and trends that “shake” the market. SunMaxx Solar’s Marketing Specialist, Matthew Brown is proudly on the cover of Solar Industry Magazine with his article on unorthodox solar sales strategy. Matt Brown’s article aims to expand the market for solar thermal collectors while redefining solar thermal collectors in a more simple and approachable direction. Brown believes that using excessively technical terms and offering too many product choices is inhibiting the solar thermal market from expanding to the broad public simply because it’s not that simple. The article assures other distributors of solar thermal systems that trying to sound overly sophisticated and scientific will scare customers and cause them to overthink and second-guess their purchase. To read Matthew Brown’s full article, please go to the cover of the October 2012 issue of Solar Industry.